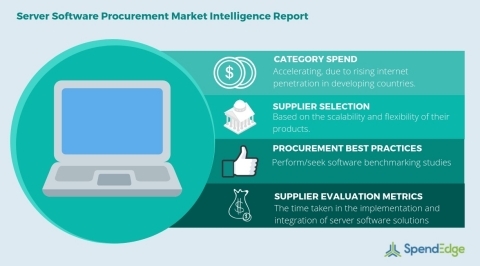 SpendEdge, a global procurement market intelligence firm, has announced the release of their Global Server Software Category - Procurement Market Intelligence Report. According to this procurement report, the server software market will experience a positive spend growth momentum owing to the increasing adoption of cloud computing solutions that rely on high-end server software solutions for operations. Such solutions are known to reduce the overall TCO of a business undertaking. This procurement report has highlighted the factors that can pose potential challenges for the investors in the server software market. Download a free sample to know how to mitigate such complexities and ensure business continuity in the market. "The buyers should analyze their TCO in terms of the required level of customization and service expected from the suppliers to procure the best server software solution," says SpendEdge procurement expert Tridib Bora. This report has identified crucial parameters that can be leveraged to achieve significant cost savings even in this competitive server software market. It has also identified the best server software suppliers who provide the software at competitive rates. Get in touch with us today! to get personalized insights from our procurement experts. The server solution provider must offer advanced features that can ensure the security of information. The buyers must ensure the scalability of the server solutions to expand their data requirements based on business growth. Request for a customization and get personalized insights on how you can create an effective market strategy to mitigate procurement challenges. SpendEdge's procurement market intelligence reports for the information technology category provide detailed information on the major cost and volume drivers that impact category growth. Such information will help the buyers as well as the suppliers to determine the total cost of ownership and replan their procurement strategies accordingly. Additionally, SpendEdge's reports provide insights on the sustainability and procurement best practices for the category.